DataLocker Sentry EMS encrypted flash drives through this advanced management console. • Take control of encrypted mobile storage. • Mitigate risks of data loss. • Enhance productivity and collaboration. With DataLocker’s secure cloud-based service, you will be up and running within 15 minutes without the need for additional IT resources. Efficiently administrate the security of all EMS compatible encrypted flash drives and hard drives. Provision and initialize devices in ways that fit how your organization works – deploy by workgroups, activate devices by email, or distribute pre-initialized devices directly to employees. A single console gives your administrators an up-to-the-minute view of all applicable devices under their management, no matter where those devices are in the world. Your own dashboard presents easily scanned charts and graphs showing data about all devices under your management including user status, device status, device location and activity, device software version and more. Many agencies have strict IT requirements for deploying USB drives within their environments. IronKey EMS Anti-Malware service, McAfee, allows administrators to enable AutoRun Malware Defense as just one of the key features to meet and exceed these requirements. With an on-board antivirus program that runs real-time monitoring of the files being stored on your secure mobile storage device, you can protect against viruses, worms, trojan horses and other malware threats when the device is being utilized on a Windows system. To start using IronKey EMS Cloud you need an IronKey EMS Cloud-account and a device license per manageable device. Licenses are available in 1-year (minimum purchase of 5 licenses) of 3-year (no minimum) licenses and renewals. IronKey EMS Cloud (per device) - 1 year of Enterprise Management Service for an IronKey EMS manageable device. IronKey EMS Cloud (per device) - 1 year Renewal of Enterprise Management Service for an IronKey EMS manageable device. IronKey EMS Cloud Anti-Malware (per device) - 1 year of Anti-Malware Service for an IronKey EMS manageable device. New or existing EMS-1 required for each device. IronKey EMS Cloud Anti-Malware (per device) - 1 year Renewal of Anti-Malware Service for an IronKey EMS manageable device. New or existing EMS-1 required for each device. IronKey EMS Cloud with Anti-Malware (per device) - 1 year of Management Service and Anti-Malware for an IronKey EMS manageable device. 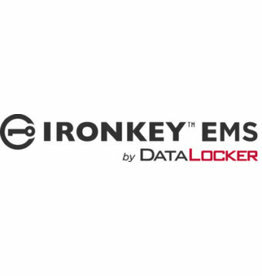 IronKey EMS Cloud with Anti-Malware (per device) - 1 year Renewal of Management Service and Anti-Malware for an IronKey EMS manageable device. IronKey EMS Cloud (per device) - 3 year of Enterprise Management Service for an IronKey EMS manageable device. IronKey EMS Cloud (per device) - 3 year Renewal of Enterprise Management Service for an IronKey EMS manageable device. Account Setup for IronKey EMS Cloud (One-time) - Includes 1 device license for 3 years of Enterprise Management Service for an IronKey EMS manageable device.